I can’t help myself – “Once upon a time in New York…” there arrived, separately, a golem and a jinni. Actually, the year is 1899. The golem was created to be a companion to a very lonely man in Germany who then emigrated to the US but died en route. The jinni was from wherever jinnis come from – Syria in this case -he had been in held in captivity and forgotten but then accidentally released by a artisan iron worker in New York. 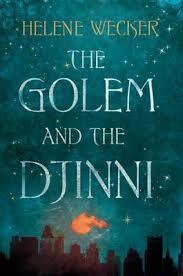 The golem, Chava, has some initial problems with New York, but is rescued by a knowledgeable Rabbi. Ahmad, the jinni, is kept in a room by his releaser until he’s fit for the outside world. The jinni is trained as an apprentice iron-worker and the golem to be a baker. Each of them has a special talent -Chava can read people’s desires, Ahmad can enter people’s dreams. Chava knows exactly what the bosses and customers at the bakery want. Ahmad enters the dreams of Sophia Winston, the very rich girl he is falling in love with (and she with him). Neither one sleeps really – so one night they meet.